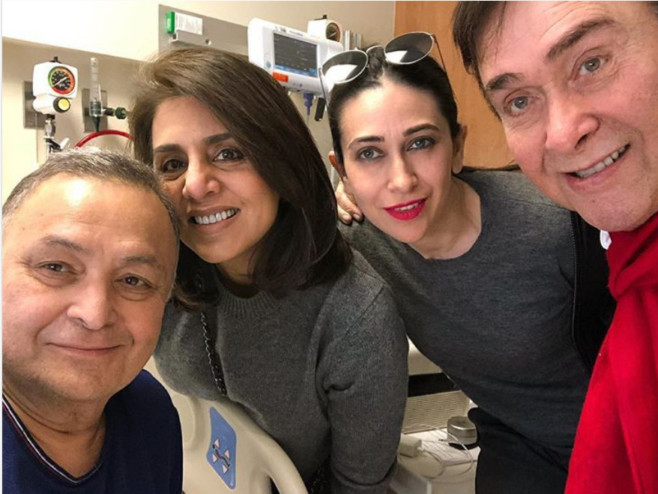 Veteran actor Randhir Kapoor along with his daughter and actress Karisma Kapoor paid a visit to his brother Rishi Kapoor, who is currently undergoing medical treatment in New York. Rishi’s wife and veteran actress Neetu Kapoor on Tuesday took to Instagram and posted a photograph of Rishi sharing smiles with Randhir and Karishma in a hospital. “The bestest brothers ever... Their conversation is only food though. Family bond forever,” Neetu captioned the photograph. Last year, Rishi shared that he was flying to America for medical treatment. “Hello all! I am taking a short leave of absence from work to go to America for some medical treatment. I urge my well-wishers not to worry or unnecessarily speculate. It’s been 45 years ‘plus’ of wear and tear at the movies. With your love and good wishes, I will be back soon,” Rishi tweeted in September 2018. In the past, several actors including Anupam Kher, Alia Bhatt and Priyanka Chopra Jonas were seen meeting Rishi in the city.